This one-pot wonder is a seriously chunky, hearty, flavoursome stew that makes for an easy winter dinner. Barley is an old Irish grain that’s wholesome and nourishing. The butterbeans add another wholesome element to this dish. 1. Rinse the barley well and drain in a colander. 2. Add the oil to a large pot set on a high heat and heat up for 1 minute. Add the onion and garlic and cook for 2 minutes, stirring occasionally, then add the tomatoes and cook for 5 minutes more. Add a little water if it’s starting to stick to the bottom of the pot. Add the leeks, carrots, thyme leaves, bay leaves, lemon juice and white wine and cook for 5 minutes. Now add the veg stock and barley and bring to the boil, then reduce the heat and simmer for 45 minutes, until the barley is cooked through and is soft, almost like rice. 3. Add the butterbeans to the pot and heat through for 3 minutes. Finally, add some chilli flakes if you have some and you like a bit of spice and a pinch of salt and pepper. If the stew is too thick, add a little more water. Remove the bay leaves and serve with some nice crusty bread. Tip: If you don’t eat all this stew in one sitting (and it will actually taste even better the next day), you’ll need to add more water when you reheat it, as the barley will keep absorbing the liquid. This will last for up to three days in the fridge. Delicious stew! 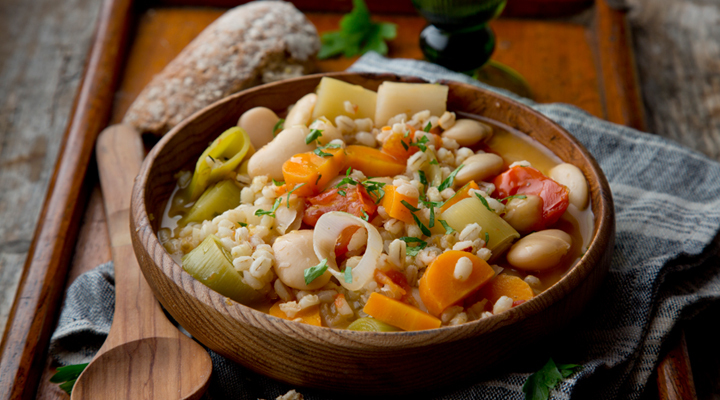 Great way to add beans and barley to our diet! We served it with toasted potato-carraway seed bread which was wonderful. I will definitely redo this recipe.